Remember Seagate’s GoFlex Satellite, a nice-looking portable wireless storage for iOS gear? This market is obviousyl booming due to the onslaught of smartphones, tablets and personal media players. The latest entrant includes Kingston which previewed a similar pocket-sized drive at Computex. Aptly named Wi-Drive, this battery-powered, flash-based portable drive acts as a media server that streams 720p video, music and other media to your devices via a dedicated iOS app (Android app is coming within 1-2 months). It’s got other features. As a result of this media serving-focus, the product is lacking standard features such as backup tools. It does let you manage individual files, either through a web-based interface or via the included mini-USB cable. The Wi-Drive is also a wireless base station, but Engadget found out that “maintaining a constant connection will drain battery life, especially when using the Wi-Drive in bridge mode to access an Internet connection”, so you should take that into account when making a purchasing decision. Kingston says the battery has enough juice to allow for non-stop video streaming to three devices simultaneously for four hours. 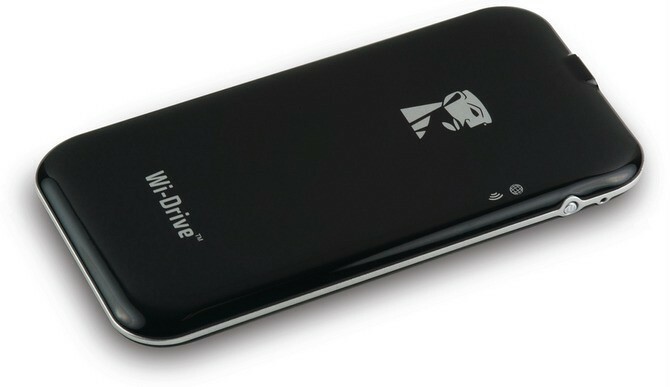 The Wi-Drive will set you back $130 for the 16GB model ($45 extra for double capacity).